Seriously, if you're going to go for boutiques, spas and decadent luxury, there's only one place to really pull out all the bells and whistles, Dubai. With over 70 different retail malls, including the world's largest, this is not a place to come to if you're not intending to splash the cash and from traditional souks to shimmering skyscrapers, no grain of sand is left unturned when it comes to your shopping pleasure. Aside from the retail therapy, Dubai is also a hot spot for contemporary architecture, sports stadiums and historical sites of interest however, bear in mind that several cultural nuances may stand in the way of your 'normal' every day holiday experience. Getting a wee bit worse for wear in public is definitely not tolerated and dressing modestly, especially women, is deemed as standard practice no matter what the time of day or night. Once you come to terms with the customs and local rules & regs you'll be free to take Dubai in your stride and if you're looking for the most indulgent, opulent and crazy-rich hotels on the planet then prepare to set your jaw to drop and your wallet to open. The setting: An envious location on the world-famous Palm Jumeirah Island, Dubai. The scene: Totally tropical with a Polynesian theme running through its core, the Sofitel promises panoramic sunset views as well as gorgeous gardens and full range of facilities. The stay: Choose between almost 500 guest rooms and suites each of which has a spectacular arrangement of luxurious comforts including en-suite bathrooms, king-size beds and rainforest showers. Away from the in-room delights there's a long list of outdoor activities, including: yoga, pilates, beach volleyball and watersports to keep even the Beckhams sun-kissed and satisfied. The best bits: The spa has got an incredible 28 treatment rooms so if you're looking to indulge your senses and look your best for the malls then right here is where you find a perfect pocket of pampering paradise. The setting: Excellent Jumeirah beachfront location, close to the new marina, Palm Island and several golf courses. 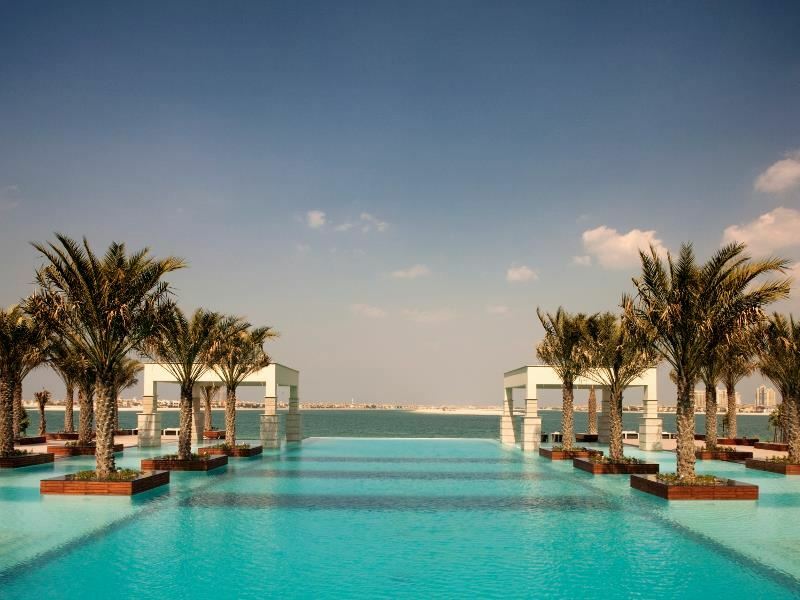 The scene: If you fancy a romantic break for 2 with dips in infinity pools and moments of calm as the sun sinks into the ocean then check out the Habtoor Grand Resort and you definitely won't be disappointed. 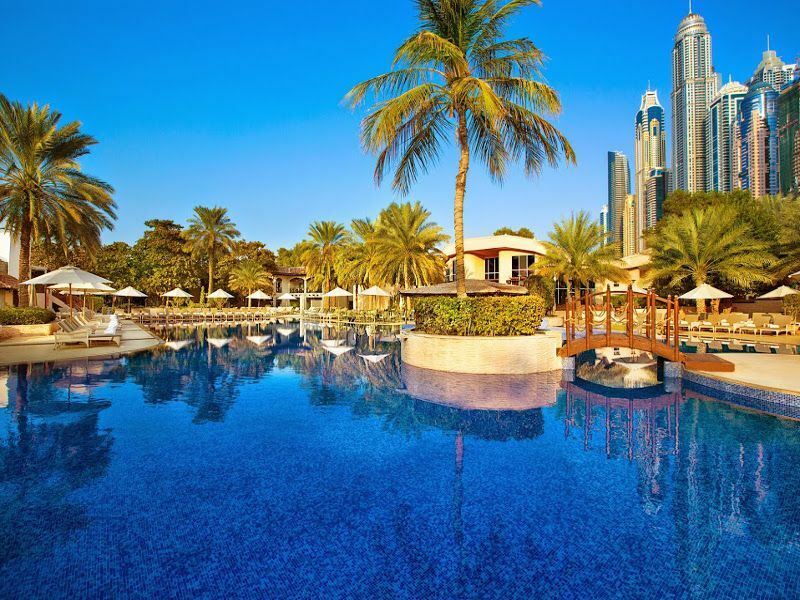 Loads of fabulous facilities, including: poolside Jacuzzi, squash courts and flood-lit tennis courts mean that you get to experience Dubai at a pace that suits you which can't be bad no matter what you're planning on getting up to. The stay: Almost 20 restaurants and bars on-site give you some indication just how seriously these guys take their downtime with Lebanese, Thai, French and even an English-style pub providing plenty of options to kick back, relax and indulge. If you can tear yourself away from the food then the accommodation isn't bad either with almost 500 different rooms and suites supplying the utmost in modern amenities and luxury fixtures and fittings. The best bits: So many different dining options make this one of the hottest properties in town and definitely worth a second glance if you've been to Dubai before. 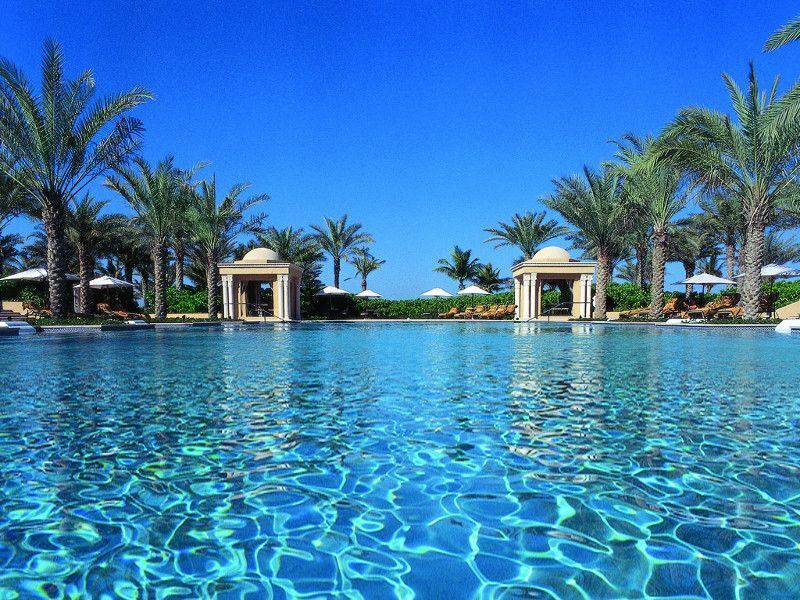 The setting: Landscaped garden setting, under half an hour from Dubai airport and about 20mins from the city centre. 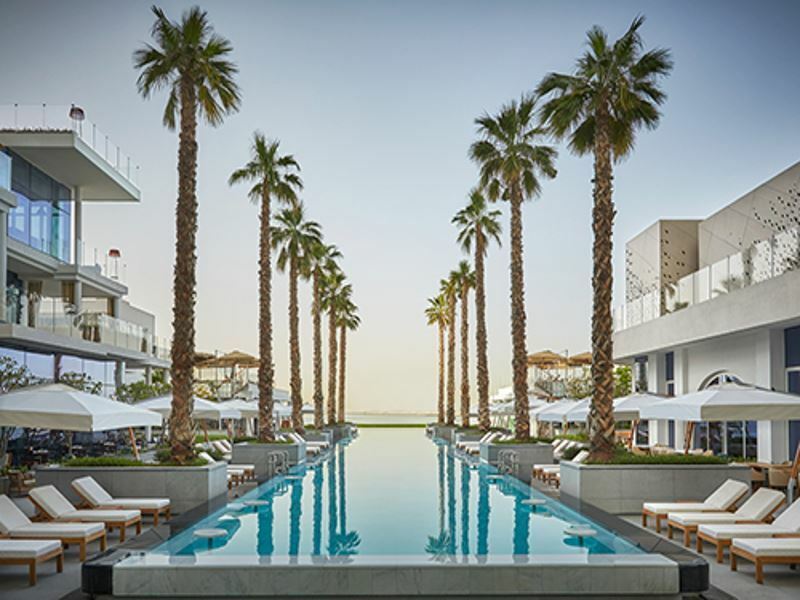 The scene: Golf courses nearby, 4 flood-lit tennis courts in-resort and a dedicated watersports centre make Le Royal Meridien an awesome option for keeping fit and active in Dubai. Also, once you've worked up an appetite, you'll find no less than 14 different restaurants to choose from with steak, pizza and regional classics providing plenty of great grub from around the world. The stay: Just a whole lot of things to do without having to go too far with daily shuttle buses transporting you to shopping heaven in the centre of the city. Over 500 rooms and suites designed with comfort and contemporary living in mind, including: satellite TV, internet access and 24hr room service. The best bits: Aside from the splendid arrangement of dining options, the 5 different bars and lounge areas are pretty hard to resist after a hard day's retail therapy. The setting: Nestled on a gorgeous man-made island just off picturesque Jumeirah beach, Burj Al Arab offers a secluded location, yet still close by to some of the biggest and best attractions. The scene: Deemed one of the finest hotels in the world, Burj Al Arab is the ultimate indulgence. With eight employees to every suite, you'll be graced with the most incredible service, where nothing is too big or small. The nine restaurants are truly decadent, including the Nathan Outlaw at Al Mahara with some of the freshest and most sumptuous seafood in Dubai. The stay: The suites, ranging from Deluxe One Bedroom Suites and Diplomatic Three Bedroom Suites, are splendidly decorated, with intricate Arabic interior designs and unsurpassable views of the ocean. The Royal Two Bedroom Suite is one of our favourites, featuring sprawling windows letting in glorious natural light, and even its own private lift and cinema room. 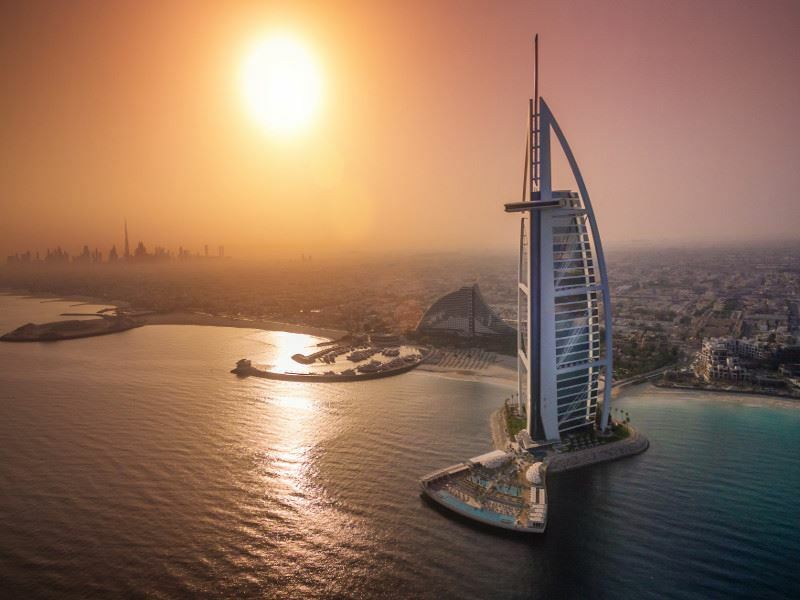 The best bits: Guests will be treated to complimentary access to Burj Al Arab Jumeirah's Terrace, a simply stunning terrace that juts 100m out into the Arabian Gulf. Built in Finland, the Terrace boasts two swimming pools, and private cabanas with butler service and amazing views. The setting: Another exclusive Palm setting, this time on the western crescent, with awesome views of the surrounding ocean. The scene: Designed to reflect the past as well as the future, you'll discover a wonderful world of Ottoman-style architecture as well as an super selection of facilities all neatly captured within a manicured garden juxtaposed against shimmering white sands. The stay: With complimentary tickets to the Wild Wadi Waterpark included there's plenty to get excited about besides the fabulous Palm frond location and from its own boutique shopping arcade to a cinema, gym and lagoon-style swimming pool, the Jumeirah Zabeel Saray typifies the exclusive luxury of a holiday in Dubai. Just over 400 rooms, suites and villas offer incredible ocean views as well as a full quota of modern and luxurious fixtures and fittings, including: iPod docking stations, 24hr in-room dining and high-speed internet access. The best bits: A fabulous choice of restaurants will leave your taste buds completely sated and there's no better way to work up an appetite other than a day out at the nearby water park. The setting: Nestled along a private beachfront on the Palm Jumeirah archipelago. The scene: Ultra-modern and sophisticated, FIVE Palm Jumeirah Dubai is ideal for discerning travellers hoping to relax and soak up the sun. The private beach and glistening pool presents a postcard-perfect backdrop to your refreshing cocktail. The stay: Accommodation comes in the form of classy rooms and suites, most of which have floor-to-ceiling windows looking out onto the city, and contemporary yet classy interiors. The best bits: The divine Elevate Bar up on the 13th floor offers some of the most incredible views of the city. The cool, young vibe adds another je ne sais quoi to this trendy wine bar. The setting: A picture perfect location on the eastern curve of the Palm Jumeirah and about half an hour from the airport. 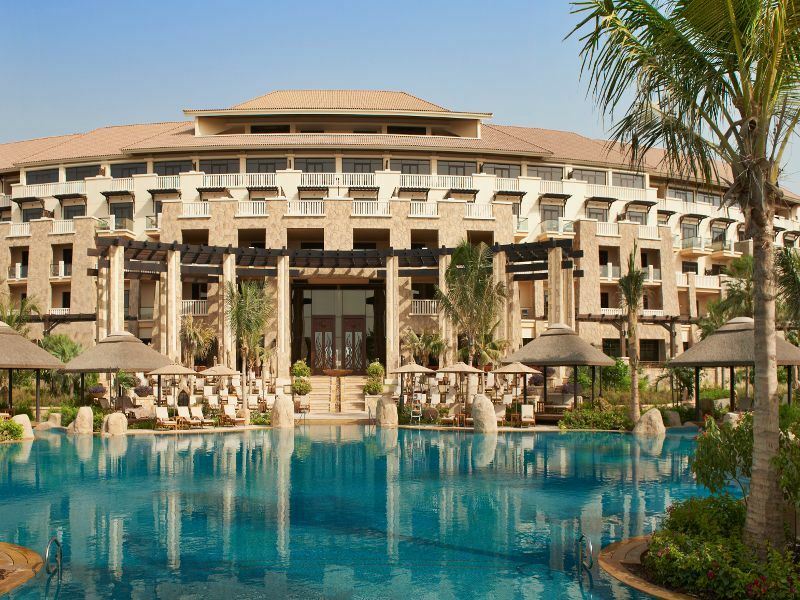 The scene: Pretty much as close to a tropical oasis as you can expect in the UAE, the Waldorf Astoria is all about the sand, sea and sublime sunshine with an elegant interior to make even the most VIP feel at home. The stay: No matter whether you're checking out the restaurants, the bars or the wide range of sports and watersports there's always an extra elegant touch to remind you that this is no ordinary hotel break. The rooms and suites, especially, demand attention and from incredible sea views from the balconies to a couple of super comfy queen-size beds, there's no better place to start or end your day in Dubai. The best bits: Dinner at Social has to be up there with the best of them as thanks to the designs of 3-star Michelin Chef Heinz Beck you'll discover fine, yet casual, dining on an epic scale. 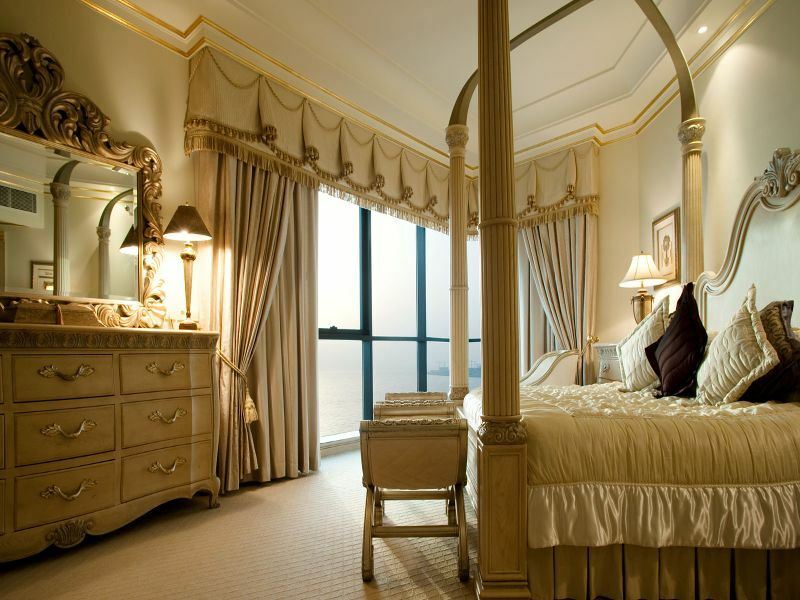 The setting: This luxurious hotel is located only a 40 minute drive from downtown Dubai's malls and iconic attractions. The scene: The first thing you'll notice is the phenomenal views of the sparkling Arabian Gulf. Then, it'll be the sprawling golf course that sweeps in front of the resort, and the gorgeous pool nestled right next to the sugary sand beach. Bliss. The stay: Just yards from the beach, JA Palm Tree Court's suites are a truly glamorous affair, with expansive balconies and terraces looking out onto the sea, and rich colours adding a touch of indulgence and style. The 800m private beachfront offers the perfect spot to soak up the sun, and the four swimming pools are ideal for a refreshing dip. End your day with a decadent dinner right by the ocean, and you've got yourself a luxurious stay. The best bits: JA Palm Tree Court is ideal for those who get itchy feet after too much sunbathing, and prefer to add a few activities to their stay. From the nine-hole golf course and the clay pigeon shooting nearby, to desert safaris and complimentary water sports, days can be as busy or as relaxed as you like. The setting: Under half an hour from Dubai's international airport, next to Burj Al Arab and Wild Wadi Waterpark and around 10 mins from the nearest mall. 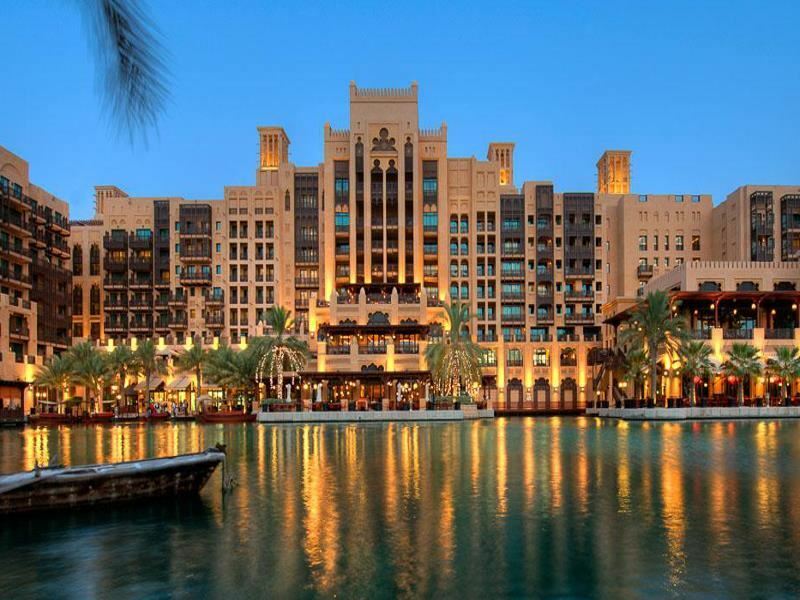 The scene: Madinat Jumeirah is a luxurious resort complex, comprising of three lavish hotels: Jumeirah Al Naseem, Jumeirah Mina A'Salam, and Jumeirah Al Qasr, plus a selection of 29 summer houses in Jumeirah Dar Al Masyaf. The stay: All of the hotels have their own unique personalities. Jumeirah Al Naseem is one of the most luxurious, built around gorgeous inland waterways and offering rooms inspired by Dubai's Bedouin traditions. 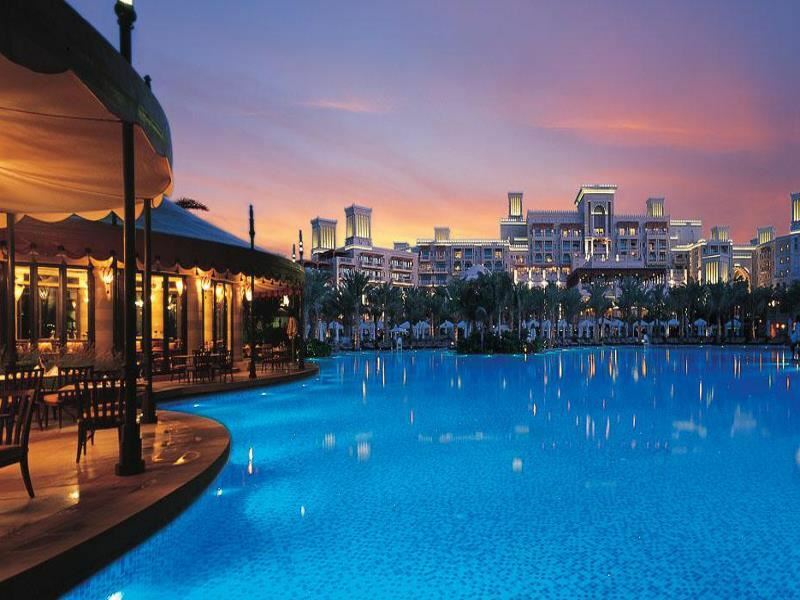 Meanwhile, Jumeirah Mina A'Salam is both peaceful and family friendly, with a great kid's club and rooftop pool, and Jumeirah Al Qasr is built much like a luxurious palace. All have access to the resort's indoor and outdoor pools, over 40 decadent restaurants, and the beautiful, tranquil spa. The best bits: The spa is so vast that you could lose yourself for at least a couple of days. However, if you find your way out then you've got to check out the 1000 seater amphitheatre that hosts live performances and evening entertainment. Jumeirah Al Naseem is the closest to the heavenly spa, and the intricate inland waterways offer a romantic and peaceful backdrop. 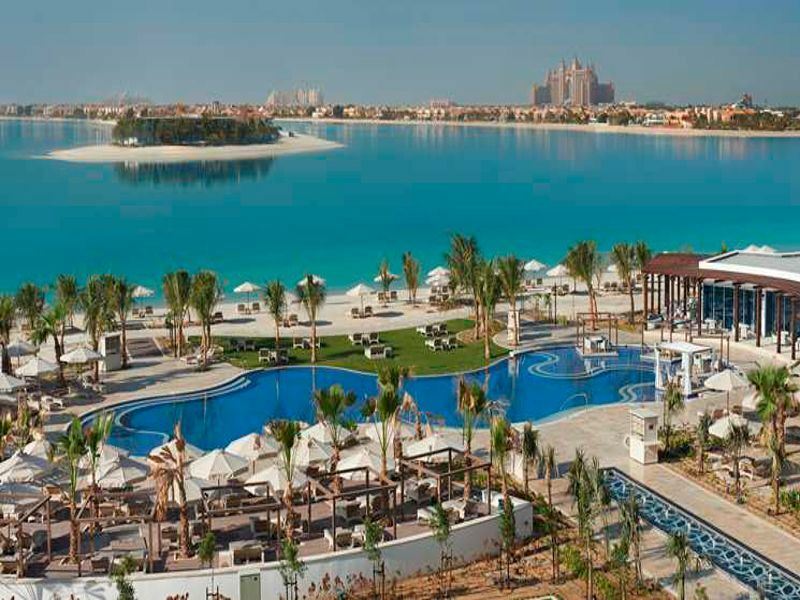 The setting: Overlooking Palm Island and around 20 mins from the international airport and Dubai central. The scene: Another triple hotel complex of awesomeness with a 1km private beach and plenty of lush green tropical fronds to put you in mind of an Arabian oasis. The stay: Choose from a superb range of rooms, suites and villas all of which promise a bewildering array of amenities as well as some superb balcony or terrace views of the ocean. This is an elegant and intimate residence with traditional-style architecture helping to create a charming and magical base from where to explore the rest of Dubai. Loads of watersports, spa services and temperature-controlled swimming pools help you get to grips with life in the UAE. The best bits: There are over 8 magnificent restaurants spread throughout the 3 hotel areas, each of which present a gastronomic journey like nothing you've ever experienced before.